From "Zuñi Fetiches," Second Annual Report of the Bureau of American Ethnology, 1880-1881 (Washington, D.C., 1883), pp. 9-15, 30-31. THE Á-shi-wi, or Zuñis, suppose the sun, moor., and stars, the sky, earth, and sea, in all their phenomena and elements; and all inanimate objects, as well as plants, animals, and men, to belong to one great system of all-conscious and interrelated life, in which the degrees of relationship seem to be determined largely, if not wholly, by the degrees of resemblance. In this system of life the starting point is man, the most finished, yet the lowest organism; at least, the lowest because most dependent and least mysterious. In just so far as an organism, actual or imaginary, resembles his, is it believed to be related to him and correspondingly mortal; in just so far as it is mysterious, is it considered removed from him, further advanced, powerful, and immortal. It thus happens that the animals, because alike mortal and endowed with similar physical functions and organs, are considered more nearly related to man than are the gods; more nearly related to the gods than is man, because more mysterious, and characterized by specific instincts and powers which man does -not of himself possess. Again, the elements and phenomena of nature, because more mysterious, powerful and immortal, seem more closely related to the higher gods than are the animals; more closely related to the animals than are the higher gods, because their manifestations often resemble the operations of the former. In consequence of this, and through the confusion of the subjective with the objective, any element or phenomenon in nature which is believed to possess a personal existence, is endowed with a personality analogous to that of the animal whose operations most resemble its manifestation. For instance, lightning is often given the form of a serpent, with or without an arrow-pointed tongue, because its course through the sky is serpentine, its stroke instantaneous and destructive; yet it is named Wí-lo-lo-a-ne, a word derived not from the name of the serpent itself, but from that of its most obvious trait, its gliding, zigzag motion. For this reason, the serpent is supposed to be more nearly related to lightning than to man; more nearly related to man than is lightning, because mortal and less mysterious. As further illustrative of the interminable relationships which are established on resemblances fancied or actual, the flint arrowpoint may be cited. Although fashioned by man, it is regarded as originally the gift or "flesh" of lightning, as made by the power of lightning, and rendered more effective by these connections with the dread element; pursuant of which idea, the zigzag or lightning marks are added to the shafts of arrows. A chapter might be written concerning this idea, which may possibly help to explain the Celtic, Scandinavian, and Japanese beliefs concerning "elf-shafts," and "thunder-stones," and "bolts." In like manner, the supernatural beings of man's fancy--the "master existences"--are supposed to be more nearly related to the personalities with which the elements and phenomena of nature are endowed than to either animals or men; because, like those elements and phenomena, and unlike men and animals, they are connected with remote tradition in a manner identical with their supposed existence to-day, and therefore are considered immortal. To the above descriptions of the supernatural beings of Zuñi Theology should be added the statement that all of these beings are given the forms either of animals, of monsters compounded of man and beast, or of man. The animal gods comprise by far the largest class. a. Í-shothl-ti-mon-á-hâ-i, from í-shothl-ti-mo-na = ever recurring, immortal, and â-hâ-i = beings. (1.) K?ia-pin-á-hâ-i = game animals, specifically applied to those animals furnishing flesh to man. (2.) K?iä-shem-á-hâ-i, from k?iä-we = water, she-man = wanting, and á-hâ-i = beings, the water animals, specially applied not only to them, but also to all animals and animal gods supposed to be associated sacredly with water, and through which water is supplicated. d. Ash-i-k?ia-á-hâ-i, from ä'-sh-k?ia = made, finished, and á-hâ-i = beings, "Finished Beings," including the dead of mankind. That very little distinction is made between these orders of life, or that they are at least closely related, seems to be indicated by the absence from the entire language of any general term for God. True, there are many beings in Zuñi Mythology godlike in attributes, anthropomorphic, monstrous, and elemental, which are known as the "Finishers or makers of the paths of life," while the most superior of all is called the "Holder of the paths (of our lives);' Hâ'-no-o-na wí-la-po-na. Not only these gods, but all supernatural beings, men, animals, plants, and many objects in nature, are regarded as personal existences, and are included in the one term á-hâ-i, from á, the plural particle signifying "all," and hâ-i, being or life, ="Life," "the Beings." This again leads us to the important and interesting conclusion that all beings, whether deistic and supernatural, or animistic and mortal, are regarded as belonging to one system; and that they are likewise believed to be related by blood seems to be indicated by the fact that human beings are spoken of as the "children of men," while all other beings are referred to as "the Fathers," the "All-fathers," and "Our Fathers." It naturally follows from the Zuñi's philosophy of life, that his worship, while directed to the more mysterious and remote powers of nature, or, as he regards them, existences, should relate more especially to the animals; that, in fact, the animals, as more nearly related to himself than are these existences, more nearly related to these existences than to himself, should be frequently made to serve as mediators between them and him. We find this to be the case. It follows likewise that in his inability to differentiate the objective from the subjective he should establish relationships between natural objects which resemble animals and the animals themselves; that he should even ultimately imitate these animals for the sake of establishing such relationships, using such accidental resemblances as his motives, and thus developing a conventionality in all art connected with his worship. It follows that the special requirements of his life or of the life of his ancestors should influence him to select as his favored mediators or aids those animals which seemed best fitted, through peculiar characteristics and powers, to meet these requirements. This, too, we find to be the case, for, preeminently a man of war and the chase, like all savages, the Zuñi has chosen above all other animals those which supply him with food and useful material, together with the animals which prey on them, giving preference to the latter. Hence, while the name of the former class is applied preferably as a general term to all animals and animal gods, as previously explained, the name of the latter is used with equal preference as a term for all fetiches (Wé-ma-we), whether of the prey animals themselves or of other animals and beings. Of course it is equally natural, since they are connected with man both in the scale of being and in the power to supply his physical wants more nearly than are the higher gods, that the animals or animal gods should greatly outnumber and even give character to all others. We find that the Fetiches of the Zuñis relate mostly to the animal gods, and principally to the prey gods. This fetichism seems to have arisen from the relationships heretofore alluded to, and to be founded on the myths which have been invented to account for those relationships. It is therefore not surprising that those fetiches most valued by the Zuñis should be either natural concretions, or objects in which the evident original resemblance to animals has been only heightened by artificial means. Another highly prized class of fetiches are, on the contrary, those which are elaborately carved, but show evidence, in their polish and dark patina, of great antiquity. They are either such as have been found by the Zuñis about pueblos formerly inhabited by their ancestors or are tribal possessions which have been handed down from generation to generation, until their makers, and even the fact that they were made by any member of the tribe, have been forgotten. 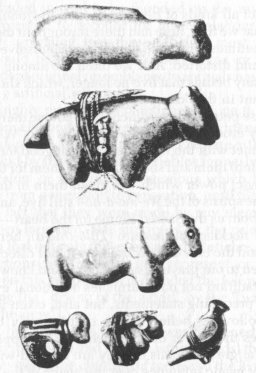 It is supposed by the priests (Á-shi-wa-ni) of Zuñi that not only these, but all true fetiches, are either actual petrifactions of the animals they represent, or were such originally. Upon this supposition is founded the following tradition, [regarding the "drying of the world" by the Twin Gods in the "days of the new"]. Now that the surface of the earth was hardened, even the animals of prey, powerful and like the fathers (gods) themselves, would have devoured the children of men; and the Two thought it was not well that they should all be permitted to live, "for," said they, "alike will the children of men and the children of the animals of prey multiply themselves. The animals of prey are provided with talons and teeth; men are but poor, the finished beings of earth, therefore the weaker." Whenever they came across the pathway of one of these animals, were he great mountain lion or but a mere mole, they struck him with the fire of lightning which they carried in their magic shield. Thlu! and instantly he was shriveled and burnt into stone. Then said they to the animals that they had thus changed to stone, "That ye may not be evil unto men, but that ye may be a great good unto them, have we changed you into rock everlasting. By the magic breath of prey, by the heart that shall endure forever within you, shall ye be made to serve instead of to devour mankind." Thus was the surface of the earth hardened and scorched and many of all kinds of beings changed to stone. Thus, too, it happens that we find, here and there throughout the world, their forms, sometimes large like the beings themselves, sometimes shriveled and distorted. And we often see among the rocks the forms of many beings that live no longer, which shows us that all was different in the "days of the new." Of these petrifactions, which are of course mere concretions or strangely eroded rock-forms, the Zuñis say, "Whomsoever of us may be met with the light of such great good fortune may see (discover, find) them and should treasure them for the sake of the sacred (magic) power which was given them in the days of the new. 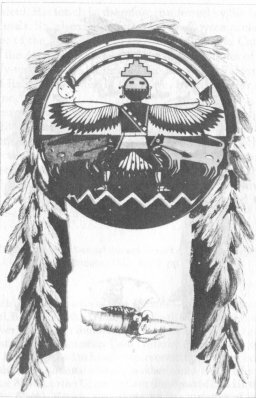 For the spirits of the We-ma-á-hâ-i still live, and are pleased to receive from us the Sacred Plume (of the heart--Lä-sho-a-ni), and sacred necklace of treasure (Thlâ-thle-a); hence they turn their ears and the ears of their brothers in our direction that they may hearken to our prayers (sacred talks) and know our wants." This tradition not only furnishes additional evidence relative to the preceding statements, but also, taken in connection with the following belief, shows quite clearly to the native wherein lies the power of his fetiches. 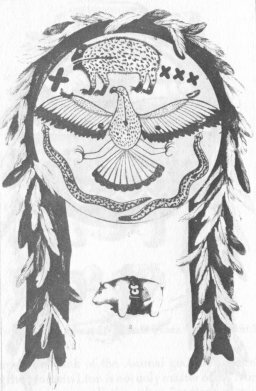 It is supposed that the hearts of the great animals of prey are infused with a spirit or medicine of magic influence over the hearts of the animals they prey upon, or the game animals (K?ia-pin-á-hâ-i); that their breaths (the "Breath of Life"--Hâ-i-an-pi-nan-ne--and soul are synonymous in Zuñi Mythology), derived from their hearts, and breathed upon their prey, whether near or far, never fail to overcome them, piercing their hearts and causing their limbs to stiffen, and the animals themselves to lose their strength. Moreover, the roar or cry of a beast of prey is accounted its Sá-wa-ni-k?ia, or magic medicine of destruction, which, heard by the game animals, is fatal to them, because it charms their senses, as does the breath their hearts. Since the mountain lion, for example, lives by the blood ("life fluid") and flesh of the game animals, and by these alone, he is endowed not only with the above powers, but with peculiar powers in the senses of sight and smell. Moreover, these powers, as derived from his heart, are preserved in his fetich, since his heart still lives, even though his person be changed to stone. . . . The relative value of these varieties of fetiches depends largely upon the rank of the Animal god they represent. For instance, the Mountain Lion is not only master of the North, which takes precedence over all the other "ancient sacred spaces" (Té-thlä-shi-na-we), or regions, but is also the master of all the other Prey gods, if not of all other terrestrial animals. Notwithstanding the fact that the Coyote, in the Order of the Hunt (the Coyote society or the Sá-ni-a-k?ia-kwe), is given for traditional reasons higher sacred rank than the Mountain Lion, he is, as a Prey Being, one degree lower, being god of the West, which follows the North in order of importance. Hence we find the Mountain Lion and Coyote fetiches far more prized than any of the others, and correspondingly more numerous. The Coyote in rank is younger brother of the Mountain Lion, just as the Wild Cat is younger brother of the Coyote, the Wolf of the Wild Cat, and so on to the Mole, and less important Ground Owl. In relationship by blood, however, the yellow Mountain Lion is accounted older brother of the blue, red, white, spotted, and black Mountain Lions; the blue Coyote, older brother of the red, white, yellow, mottled or spotted, and black Coyotes. So the Wild Cat of the South is regarded as the older brother of the Wild Cats of all the other five regions. And thus it is respectively with the Wolf, the Eagle, and the Mole. We find, therefore, that in the North all the gods of Prey are represented, as well as the Mountain Lion, only they are yellow. In the West all are represented, as well as the Coyote, only they are blue; and thus throughout the remaining four regions. The Mountain Lion is further believed to be the special hunter of the Elk, Deer, and Bison (no longer an inhabitant of New Mexico). His fetich is, therefore, preferred by the hunter of these animals. So, also, is the fetich of the Coyote preferred by the hunter of the Mountain Sheep; that of the Wild Cat, by the hunter of the Antelope; that of the Wolf, by the hunter of the rare and highly-valued Ó-ho-li; those of the Eagle and Falcon, by the hunter of Rabbits; and that of the Mole, by the hunter of other small game. The exception to this rule is individual, and founded upon the belief that any one of the gods of Prey hunts to some extent the special game of all the other gods of Prey. Hence, any person who may discover either a concretion or natural object or an ancient fetich calling to mind or representing any one of the Prey gods will regard it as his special fetich, and almost invariably prefer it, since he believes it to have been "meted to" him (an'-ik-tchi-a-k?ia) by the gods. 1. Each of the six species of prey animals--Mountain Lion (North), Bear (West), Badger (South), White Wolf (East), Eagle (Upper), and Prey Mole (Lower)--"is again divided into six varieties, according to color. . . .For instance, the Mountain Lion (Yellow) is primarily god of the North, but he is supposed to have a representative (younger brother) in the West (the Blue Mountain Lion), another in the South (the Red), in the East (the White), in the Upper regions (the Spotted), and in the lower regions (the Black). Hence, also, there are six varieties of the fetich representing any one of these divisions . . . "("Zuñi Fetiches," pp. 24-25). See figure 1 for fetich representations of these six species of prey animals. 2. "The Priesthood of the Bow possesses three fetiches. These three beings are the Mountain Lion (fig. 2.2); the great White Bear Ain-shi k'ó-ha-na, god of the scalp-taking ceremonials (Fig. 3.2), and the Knife-feathered Monster, Á-tchi-a lä-to-pa (Fig. 2.1). "This [latter] curious god, [who is] sometimes classed with [the prey animals], sometimes with the higher beings, [and who] may safely be said to form a connecting link between the idolatry proper of the Zuñis and their fetichism, . . . is the hero of hundreds of folklore tales, and the tutelar deity of several of the societies of Zuñi. He is represented as possessing a human form, furnished with flint-knife-feathered pinions, and tail. His dress consists of the conventional terraced cap (representative of his dwelling-place among the clouds), and ornaments, badge, and garments of the Kâ'-kâ. His weapons are the Great Flint-Knife of War, the Bow of the Skies (the Rain-bow), and the Arrow of Lightning, and his guardians or warriors are the Great Mountain Lion of the North and that of the Upper regions. He was doubtless the original War God of the Zuñis, although now secondary, in the order of war, to the two children of the Sun. Anciently he was inimical to man, stealing and carrying away to his city in the skies the women of all nations, until subdued by other gods and men of magic powers. At present he is friendly to them, rather in the sense of an animal whose food temporarily satisfies him than in the beneficent character of most of the gods of Zuñi.